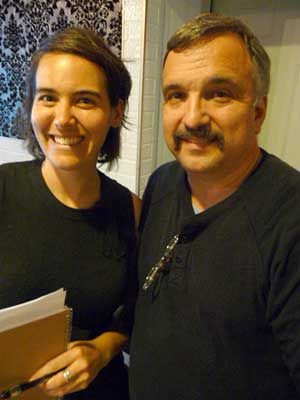 Eleanor Mayer, administrative assistant for the Wicker Park Bucktown SSA #33 tax district, with commissioner Wayne Janik of Janik's Cafe, 2011 W Division St.
Meeting commenced at 7:06 p.m. Two guest speakers representing the Wicker Park Bucktown SSA gave a Powerpoint presentation about the group. The Special Service Area is supported by the Wicker Park-Bucktown Chamber of Commerce and is the largest in Chicago. In East Village, the SSA is involved primarily with Division Street from Damen to Ashland. That includes landscaping upkeep, including the trees along Division. The SSA is helping the city reassess loading zones along Division to grant better parking access for business patrons during the day. It's looking at solutions for safer passage at the intersection of Division Street, Honore Street and Marion Court. And it is hoping to have the fences along Division Street painted. In the Polish Triangle at Division, Ashland and Milwaukee, the SSA currently sponsors Clean Sweep to pick up trash two times a week. There are plans to have the Triangle decorated for Christmas, with lights on the trees and snowflake ornaments on the lampposts. The SSA leadership meets the second Tuesday of every month. New business: A resident of EVA raised a concern about unleashed dogs in the area and the danger they bring. She agreed to write up an article for the EVA newsletter expressing her concern. Meeting adjourned just after 8 p.m.